Many smaller vessels of this type are known, with plain handle, which are slightly earlier in date; see, for example, a piece excavated from a tomb of AD 288, in Zhejiang jinian ci/Zhejiang Chronological Porcelain, Beijing, 2000, pl.125. The present type is extremely rare. The shape is in Chinese known as huzi (‘little tiger’). 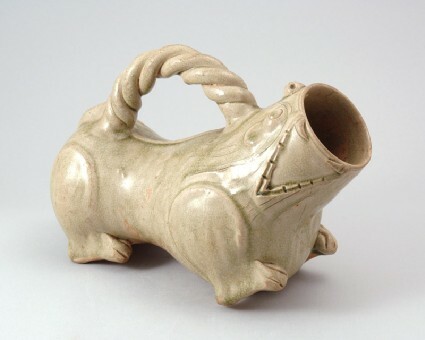 The vessel is shaped like an animal, with hollow body, prominent haunches, and short legs with simply modelled paws. The head terminates in a cylindrical opening, which emerges from the wide open mouth. Eyes, ears and nose are clearly rendered, teeth simply indicated and fangs applied, and incised lines are indicating the mane. The tail extends into a large curved over-head handle formed of three twisted strands of clay. The spine is rendered by a raised band of clay. The yellowish-beige body is covered with a transparent, light green glaze which in places adheres in a deeper green layer with a strong crackle. The underside is largely free of glaze and the biscuit has partly fired a reddish tone.